The 2016 Harvest is Here! It’s what we’ve all been waiting for! All of 2016’s hard work has finally paid off and now it’s time for one of the most important steps in wine making, harvesting the wine grapes! Harvest is determined by the level of acidity, sugars and tannin primarily based on the winemaker’s personal preference and style of wine making. Typically starting in August and ending in October, varying on different regions and climate conditions, each individual varietal will be picked in its prime condition for the region it grows in. During Harvest, various types of picking methods will be used to pull the grapes off of the vine. These methods are called mechanical harvesting and hand picking. A mechanical harvester works by hitting the vines with a rubber device until the grapes fall onto a conveyor belt and then into its holding bin. This technique is used all over the world as a much more economical and reduced labor picking method. 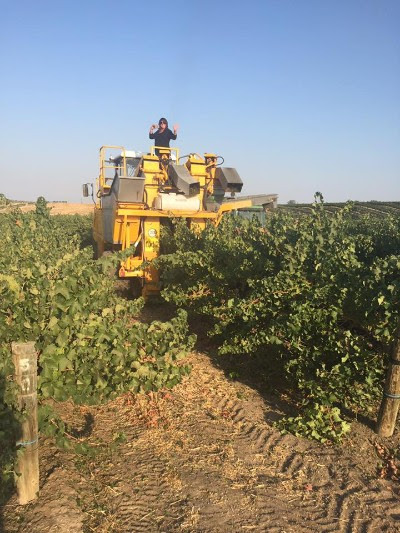 Hand picking is a much gentler style of harvest and is used mostly as a preferred winemaker’s choice and to harvest in regions that a mechanical harvester could not reach. The main advantage of hand picking is sorting through and picking only the healthy bunches of grapes in a much gentler style. August 17, 2016 marked the first pick of the year for Riverstar! We brought in only estate white varietal, Sauvignon Blanc. We very much look forward to sharing this years harvest with you. Cheers to a happy and healthy 2016 harvest!